I love to treat our children equally, so when our daughter came along I knew we had to get a first Valentine Day photo of her like we did with our son. Using many pillows propped up in the background covered by a white bedsheet and the same props I made to photograph our son 2 years earlier (including the angel wings) … I grabbed my cell phone and started snapping away. Out of dozens of photos, a few of them came out and the results are seen above. It was just be chance I walked into Baby Gap and found the little pink ballerina dress on sale for $10 and used a hand-me-down sweater from a family member to create an outfit for little girl. The bow headband added to the look so we went with it. Using an app on my phone I was able to create the collage and color correct the photos. I’m not a professional, but I’m pleased with the results. Even more pleased that now our son can’t say that he was the only one we made dress up like cupid on his first Valentines Day when he gets older! Equal and fair treatment achieved! Having loved how my son’s 1st Valentine Day hand/footprint plate turned out, I wanted to do one for my daughter – but I didn’t want it to look the same as the one our son did, but wanted it to match. Pinterest had some great ideas (as always!) and the one that caught my eye was this sweet craft with the letters in a square, https://www.pinterest.com/pin/338895940682100262/. Our daughter, who was 10 months at the time was very curious about having her hand painted and foot painted. While we have done this with her in the past – she was much more aware this time about what was going on, and the fact that she wanted to talk around the shop and play with the ceramic plates and objects was a bit stressful … until daddy jumped in and helped by taking little girl across the street to a fun play place allowing me to finish up and complete the project. Looking back at the item would have liked to have made the letters a bit thicker so that they stood out a bit more, but her sweet little hand and foot prints really pop with the thin lettering. We display her plate with our son’s in our TV Room year round. Inspired by Pinterest idea (http://www.pinterest.com/pin/207728601536942589/). My little guy was a trooper and allowed me with the help of a friend paint his little toes (again) as well as his little hand this time so we could surprise his daddy with his First Valentines Day gift. Daddy was very surprised and very happy. Great memory! Platter was $60 at a local pottery painting place near our house. Inspired by the L-O-V-E pictures as seen on Pinterest (http://www.pinterest.com/pin/428053139555007351/) I decided to make a memory to send to grandparents. I went to the local craft shop and picked up some card board letters which spelled LOVE and picked up some colorful craft paper to cover them with. They also happen to have some angel wings which were on clearance from Christmas so added score! 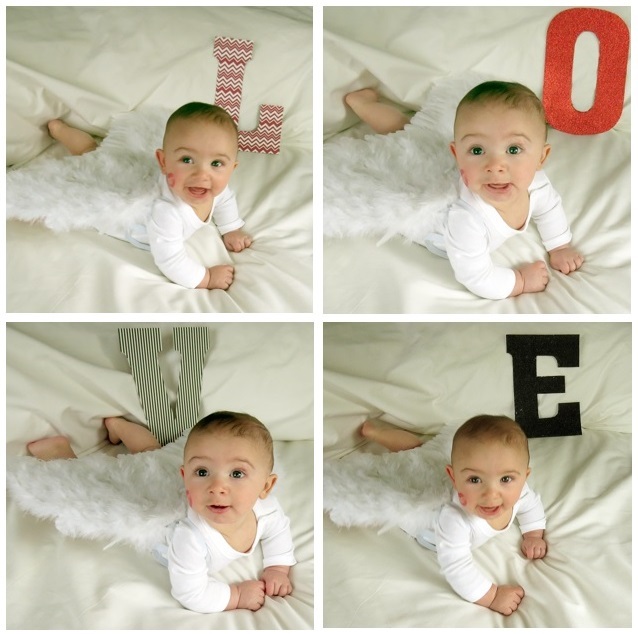 With a little help from a friend we dressed my little guy up in a white onesie, strapped on the angel wings, I gave him a big kiss wearing red lipsticks and then draped white sheets on the bed and propped up the letters behind him. Used my camera with a little help from Photoshop was able to get the following end results.